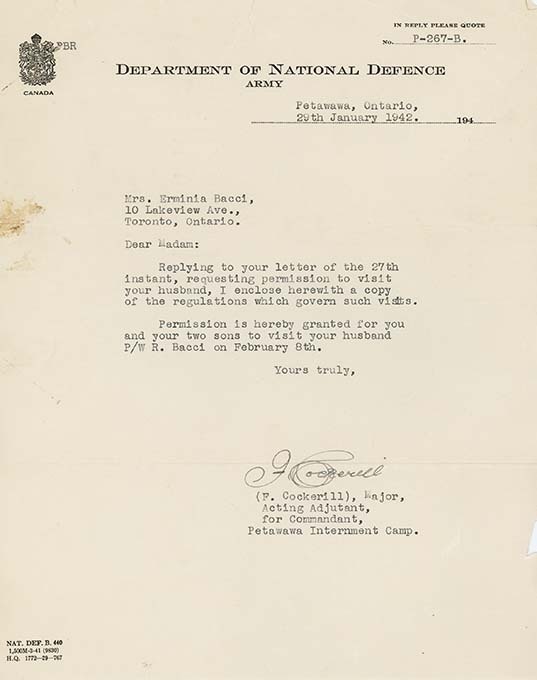 Letter from F. Cockerill (Major, Acting Adjutant, for Commandant, Petawawa Internment Camp), to Mrs. Erminia Bacci, January 29, 1942. This letter provides notice to Erminia Bacci that she is permitted to visit her husband, internee Ruggero Bacci, on February 8, 1942. She is also permitted to bring her two sons. Regulations that govern the visit were enclosed with the letter. The document referenced is most likely LICEA2012.0002.0075. Also see LICEA2012.0002.0087 and LICEA2012.0002.0051.